We only have to look as far as Folkestone for a traditional celebration of St Peter. At high tide on the Sunday nearest St Peter's Day, the Vicar of St Peter’s Church (the Seafarer’s Church) leads the Blessing of the Sea and Fisheries of which St Peter is considered to be the chief protector. Boats are rigged out with flowers and ribbons and line up to be blessed. I imagine the vicar keeps his eye on the weather forecast for days before, hoping that the waves will be kind as his blessing is usually undertaken from a small boat. 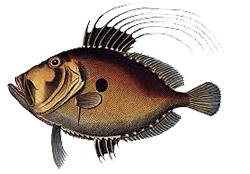 The St. Peter's fish, or John Dory as it is more commonly known, owes it’s name to legend. It is said that over 2000 years ago, St. Peter dropped a coin into the Sea of Galilee and the fish caught it. St Peter picked the fish up and took the coin back, leaving his fingerprints on the skin of the fish. The John Dory, which it has to be said is not a pretty fish, has a clearly visible spot behind the gills and has no scales. Other celebrations throughout the country bear little relation to St Peter’s links with the sea. In some areas it is a time for rush bearing processions and hay strewing in churches. In St Columba's Church, Warcop, Cumbria, a procession of boys carries crosses of rushes, which are laid around the altar where they remain over the following Sunday. They are then hung at the back of the church until a few days before the next Peter's Day. For the John Dory, heat the oil and butter in a frying pan over a medium heat, add the John Dory fillets, skin-side down, and fry for 1-2 minutes. Turn the fillet over and season to taste with the salt and black pepper. Fry for a further 2 minutes, then remove from the pan and set aside on a warm plate. For the dressing, heat the oil in a frying pan over a medium heat. Add the garlic and pepper and fry for 3-4 minutes, or until softened and pale golden-brown. Transfer the garlic and pepper to a food processor, add the honey and blend to a smooth paste. I suggest serving with crushed new potatoes (below). Spoon the crushed potatoes into the centre of a serving plate. Place the John Dory on top of the potatoes and drizzle the red pepper dressing around the edge of the plate. Boil the new potatoes until just cooked then drain and crush (not mash) the potatoes. Stir in the pesto and butter and it is ready to serve.